Purple has quickly become one of the most recognizable names in online bedding. Does the product match the hype? Read on and find out. The cover consists of polyester, viscose, and lycra. This soft, breathable fabric is designed to to increase airflow and regulate heat. The blend of materials does a nice job of wicking away moisture and keeping you cool. Lycra adds an element of stretchiness that allows for greater conformity and comfort. Purple refers to this first layer as their Smart Comfort Grid. It’s a 2” layer of Hyper-elastic polymer that visually resembles a honeycomb. It’s the core of what gives the mattress its distinctive feel. This pressure sensitive grid’s design allows for even weight distribution and support. The grid is designed to relax under pressure points to provide both support and comfort. Air flows freely through the grid; which allows for a cooler night’s sleep as well. 3.25” of 1.8 lb. density Poly foam offers plush transition support. It’s designed to ease your body into the denser, more structured base. It also increases the responsiveness of the comfort grid. 4” of 2 lb. density polyurethane foam makes up the base. This foam provides additional support, structure and shape. Our initial impressions were this mattress feels quite firm. Some pressure relief was felt but not as much contouring as some alternative options. It’s worth noting, firmness perception will vary depending on body type. Larger individuals will sink in further and interpret this mattress as being a bit softer than average size or petite sleepers. Purple performed reasonably well in this category. We noticed little motion transference. Movement was fairly easy compared to memory foam beds. Grid design does a good job of circulating air and keeping you cool. A slight non offensive "new" scent was detected after opening the package. This quickly faded. Purple foams are CertiPUR certified to not emit dangerous toxins. Although Hyper-elastic polymer is not a completely new technology, its use in consumer bedding has a limited history. However, research seems to support the idea that this technology should hold up well. The combination of the grid design with dense base and transition foams should provide decent durability. 100 night trial: Free return shipping and complete refund if not fully satisfied. Free delivery and set up. No in home set up offered. 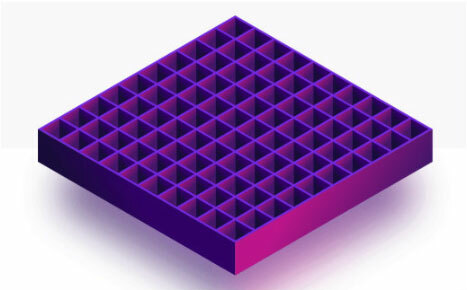 While not as much bounce as latex, Purple’s grid design allows for reasonably easy movement. Purple is an interesting product with a unique scientific approach. However, in our evaluation, we did not find that translating into an exceptional comfort feel. There are just too many other solid options available that give you more bang for the buck. While there isn’t one mattress that will be right for everyone, a medium firm is designed to appeal to the majority. The intention is to create a feel that is firm enough while on your back and stomach; but soft enough for side sleepers. How well this bed performs for you is really dependent on your weight and personal preference. During our testing, we had people of various body types give their impressions of how the Purple mattress feels. We found impressions varied. Larger individuals sank into the mattress more; making the mattress feel softer than it did for average or smaller people. This is a relatively firm mattress and most back sleeper should find Purple fairly comfortable. As we have noted, heavier individuals may experience more sinkage and require more support for proper alignment. On your side, your body weight shifts to your shoulders and hips. Our concern here is that those seeking deep body hug and conformity will find this mattress too firm. Larger people tend to sink deeper but this does not necessarily result in a more comforting feel. Stomach sleepers need a mattress that does not allow their lower backs to dip and cause lumbar pain. For most, this mattress will perform reasonably well. Of course the common theme here is that body weight is important. Larger individuals may experience too much sinkage. Low Motion Transfer: Our evaluation found relatively low motion detection. This is a nice benefit for couples. Sleeps Cool: Open grid design allows for easy air flow and breathability. Only One Firmness Option: Those seeking either a very firm or very soft mattress will need to look elsewhere. Edge support is limited: Like most spring-less mattresses, this is not a strength here. Couples who don’t want to disturb each other’s sleep will appreciate low motion transfer. We noticed little to no partner movement during our trial. If you want to sleep cool, unique grid design allows air flow and regulates heat. Those seeking significant edge support should stick with an innerspring mattress or hybrid foam and innerspring bed. 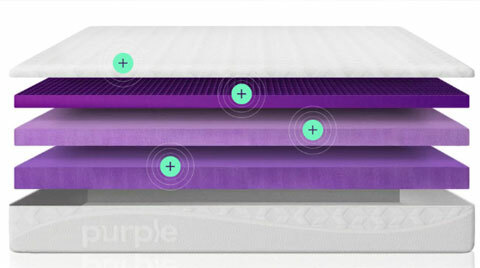 Purple’s original mattress is delivered free of charge to your doorstep in about 10 – 12 days. It weighs about 110 lbs. We recommend having a second set of hand available to bring your mattress inside and set up. After removing from its box, We recommend placing your mattress on its platform before unwrapping. Begin opening your mattress by cutting through the first layer of the plastic packaging. Take care not to rip the fabric cover. As the vacuum seal is broken, air will quickly rush in. Within minutes your mattress will take shape but will not fully expand for about an hour. We found the Purple mattress to be firmer than anticipated. Not a bad thing, just not as pressure relieving as we anticipated. Keep in mind personal comfort is very subjective. As we mentioned, sleepers of varying weights will interpret firmness in different ways. Those with greater body mass will be absorbed deeper into this mattress and experience a slightly softer feel. That said, plusher, more pressure relieving mattresses are available at this price point. Helix Mattress Review – Customize Your Comfort! Helix Mattress Review – Customize Your Comfort!